Marred by an autocratic dictatorship regime for over a century, Nepal first opened its gates to foreigners only in the 1950s, after the restoration of democracy. Ever since, the country has quintessentially fascinated and drawn global tourists with its mysticalatmosphere. Thanks to dreamlike mountains, Hindu and Buddhist pilgrim sites, beautiful countryside, and lush southern jungles, it didn’t take long for Nepal to carve a place for itself in the world map. Quickly realizing its touristic potentialities, the Nepal government has consistently made efforts to upscale Nepal’s tourism capabilities and its contribution towards economy. In 2017 alone, Nepal witnessed a record 940,000 visitors, creating more than 427,000 jobs and pumping Rs. 177 billion into the economy. However, proud stances like this wouldn’t have been possible without nationwide tourism campaigns that were held in different time intervals since 1990s. Today, as Nepal prepares for the third edition of a year-long tourism campaign, Visit Nepal 2020, with the aim to welcome more than 20 million tourists, we will look back at previous editions – Visit Nepal 1998 and Nepal Tourism Year 2011 – to see how the Nepalese tourism industry has evolved. In 1996, His Majesty’s Government declared the year 1998 as Visit Nepal ’98 in order to further bolster the country’s image as a special destination for visitors. With an aim to welcome more than half a million tourists, the country vigorously geared up for the year-long festivities with its slogan “A sustainable habitat through sustainable tourism”. This visionary theme highlighted the need to make tourism work in harmony with the environment, and promoted eco-friendly and value-based tourism. The then government brought on some notable improvements, especially in aviation sector, like increasing number of international flights and seat capacities. With it s extensive promotional and hospitality services, the country successfully welcomed a huge influx of tourists and even lengthened their duration of stay. In 2009, the government of republic Nepal announced that the year 2011 will be celebrated as Nepal Tourism Year. 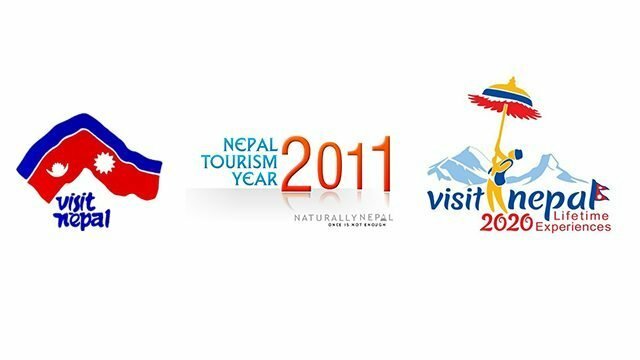 In order to make Nepal Tourism Year 2011 a grand success, the government had brought ‘one-district, one-destination’ identification program with infrastructural development and promotion of particular places. Extensive promotional programs for adventure and cultural tourism were conducted by Nepal Government through its “Nepali Temperament, Welcome and Hospitality of Guest”. On economic front, a huge chunk of budget was allocated for upgrading the airports in Janakpur, Rajbirah, Mugu, Humla, Dolpo, Kalikot, and Dhangadi. The Dhangadi and Simaraaiport were even equipped for nighttime landing and takeoff for the first time. The tourism board also ran several Visit Nepal campaigns in various countries like Germany, Denmark, Dubai, Thailand and USA. Although it missed its one million tourists target, the country welcomed over 700,0000 visitors, which in itself was a record number of tourists at that time. Impressively, tourism accounted for over 7% of GDP (more than $1 year). All in all, the campaign helped to cleanse Nepal’s image and boost its tourism industry which plagued by a decade-long political turmoil and civil war. Now for the Visit Nepal 2020 edition of Nepalese Tourism Year, the federal republic of Nepal has set determined plans to operate two new International Airports in Pokhara and Lumbini. With the addition of a new Airbus 330-220 to serve a large number of tourists, the government also plans to run Tribhuvan International Airport for additional 3 hours from regular 18 hours to ensure the availability of services for incoming and departing tourists. It is reported that the government is also finalizing air service agreements with countries like UAE, Turkey, Japan, Egypt, and China among others. Similarly, in order to make its Tourism Act more contextual, the government plans to amend Casino Regulation, Tour and Trekking Regulation, and Mountaineering Expedition Regulation. The private sector has also shown its eagerness in making 2020 a successful year. The private hotel sector plans to add 4000 new rooms in four and five-star category in hotspots like Pokhara, Kathmandu, and Chitwan. International hotel chains like Marriott, DoubleTree, and Hilton are also expected to make their debuts in near future. Visit Nepal 2020 – What to expect? Next articleWhy Barcelona is the European Capital for Weed?